Our vertical garden is over 19′ tall and 19′ wide. 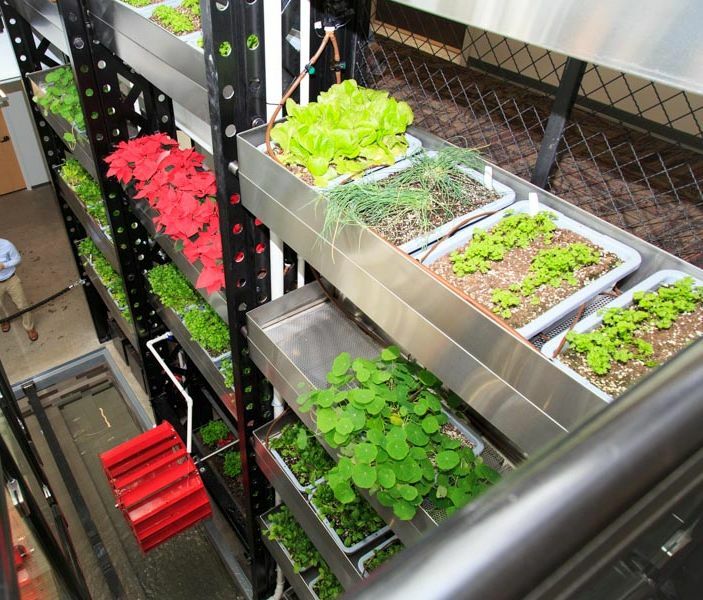 It houses vegetables and herbs that we will use in The Market at I-Square restaurants. The plants, germinated at Genrich’s Garden Center in Irondequoit, are irrigated utilizing the rainwater from the rooftop and stored in two 210 gallon tanks located on the top of the garden. LED grow lights, as well as the skylight above, provide sufficient lighting to keep the plants growing. Incorporated into the garden is a 3’ water wheel that will produce hydropower in the future.